Here is a great opportunity in the heart of Mission Valley. This Mission Valley, San Diego restaurant is literally in the middle of the city, right in the sweet spot for favorable fast casual restaurant demographics. Seller is willing to finance for the right buyer. Mission Valley opportunities like this don’t come along often, now is the time to take advantage of this great restaurant. Owner just recently took this place down to the studs and concrete for a complete remodel and it’s beautiful. Seller has installed all new flooring, HVAC, and walls coverings. Keep the current very popular concept or bring your own landlord approved concept, this location is a winner and will support anyone with good food and service. Restaurant is perfectly set up for the crowds that swarm this super busy center. Lunch time is standing room only and with minimal effort from a dedicated owner, dinner will be cranking too! Beer and wine license already in place. Current year to date pnl (to August 15th) shows an adjusted net profit of 51,207. With no advertising they are doing about 32k per month gross sales. This number will only increase with the ever expanding customer base in the process of opening up, have you see all the new development in Mission Valley? Catering and delivery opportunities are largely untapped as owner doesn't’t have time to develop this location. Space is approximately 1100 square feet and base monthly rent is 6472, Cam is additional 860. They have a very nice exclusive use patio available to them that is in addition to the well set up community outside/patio style dining areas already provided by the center. Current lease term expires July 2019 with a five year option available. 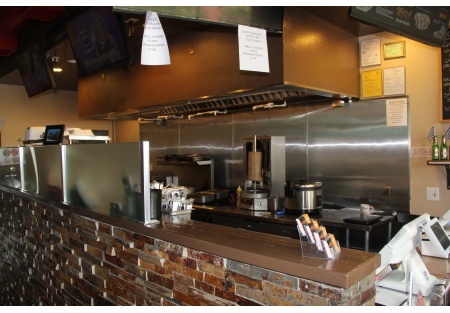 Owner has another full service restaurant along with a distribution businesses so he simply has run out of time and decided it’s time to let this place go, and he is willing to finance the right buyer. Jump in now to the successful Mission Valley food service scene, locations don’t get much better than this one.